Detective Comics #463 © 1976 DC Comics. COVER ART BY ERNIE CHUA. Black Spider is noteworthy more for his ethnicity than his originality. 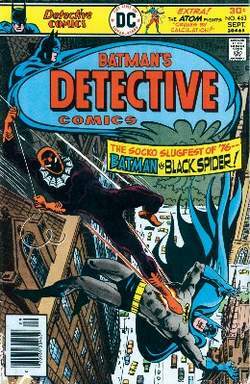 Swinging into Detective Comics #463 (1976), in a tale by writer Gerry Conway and artist Ernie Chua, Black Spider is a selfprofessed Batman emulator and costumed sniper who puts a bullet through pusher Doc Sugarman, provoking a slugfest with the Caped Crusader. Issue #464 reveals the villain's true identity, Eric Needham—a former junkie who accidentally killed his father, inspiring his sobriety and vendetta against drug peddlers—who happens to be African American. Renowned for his proficiency with his wrist-mounted pistols, Black Spider was Batman's first black rogue (discounting Eartha Kitt as Catwoman in the alternate reality of the 1966–1968 Batman television show) and DC Comics' first black supervillain. A relic of the 1970s, the character was seen only a handful of times before being put out to pasture by the creative team of Alan Grant and Norm Breyfogle in Batman: Shadow of the Bat #5 (1992), in which Needham became a suicide bomber to wipe out a narcotics ring. Receiving his walking papers from hell by Lucifer himself, Needham made cameos in Neil Gaiman's “The Kindly Ones” in Sandman vol. 2 #57–#69 (1994–1995), but conversely was shown in hell as Black Spider attempting to broker a deal with the demon Neron in Underworld Unleashed #1 (1995). Narcissistic hitman Johnny LaMonica assumed the Black Spider's costumed identity in Batman #518 (1995), contracted to kill Gotham crime boss Black Mask. Not unlike his predecessor, this Black Spider has maintained a meager status among Batman's rogues, although his inclusion in the miniseries Villains United (2005) may hint at a larger profile in the DC Universe's web of evil. Thin his arms were as his legs, and, as Michael first beheld him, he had all the seeming of a big-bellied black spider. Well, I'll do what I can," said Miss Ophelia; and she approached her new subject very much as a person might be supposed to approach a black spider, supposing them to have benevolent designs toward it. Alanna will be appearing as the Black Spider in Cirque du Soleil's new UK production of Ovo next year. The tennis coach, 57, revealed she had her first inking last week - a black spider at the base of her neck. Yashin was nicknamed the Black Spider due to his super reflexes. The cast of 50 performing includes British gymnast Alanna Baker, bronze and gold medallist at World and European Championships, as the Black Spider. The 50-strong cast features performers from 17 countries and includes British gymnast and 2011 European champion Alanna Baker as the Black Spider. Colombian black spider monkeys Valentine, Charlie, Chester r and Evita appear alongside TV's Ruth Jones and Ben Miller. The heir to the throne's black spider letters to government ministers revealed he'd been badgering them to save the endangered species found 10,000 miles away in the South Atlantic. HE'S NOT quite at black spider letter levels yet but I was still surprised to see Prince Harry making a political point on DIY: SOS last Wednesday. Higham: Black Hoppers, CdC emergers, Mayfly, Black Spider, Black Buzzers, Olive Damsels.